Making Malt: in the final presentation we were taken from ancient times and traditional floor malting into the present day, where modern germinating kilning vessels can make up to 500 tons of malt at a time, in a continuous batching process. Most of the malt made in Britain is used in the brewing and distilling industries, with roughly 500,000 tons of malt each year being used by commercial brewers and 800,000 tons going to the distilleries. There are around twenty million casks of whisky maturing in the 115 distilleries around the UK. Our third speaker, Eric Walker, was a man with lots of experience in every aspect of the malting, brewing and distilling industries. He began with a quick look at making malt in the distant past, pointing out that malt has been important for a very long time. Its' origins are lost in the mists of time. There's a story that ancient Egyptians, around 3000 years ago, may have made their malt by putting grain into baskets, then lowering the basket into a deep well. The basket could be raised and lowered, effectively steeping the grain. It would germinate in the basket and was shaken at regular intervals to prevent the rootlets from matting. Green malt was dried in the sun. The method is described in detail here on the Briess Malt web page. I'm not so sure this was an efficient way to make large amounts of malt for brewing. Perhaps enough could be made for small scale brewing. It would be interesting to do some experimental and practical work, to assess the validity of the idea that malt can be made in a well, using a basket. I wondered how much malt could have been made in this way. There would not be enough to supply large vats like those at Hierakonopolis, a predynastic site in Egypt, which were probably used as mash tuns. Beer was being made here in industrial quantities. The Egyptians must have used floors for germinating the barley. A malting floor is not an obvious thing to identify in the archaeological record. All that's required is a smooth level floor surface within a building. It's something that has been overlooked in the interpretation of archaeological sites. Archaeologists don't often interpret the remains of a building as having possibly been a grain barn or a floor surface as having been being suitable for making malt. Eric talked about malting floors and the potential evidence for the manufacture of ale in prehistory. I was rather pleased that, on his next slide, he showed some of the evidence for the making of malt and ale in Neolithic Britain. That's my research. There is good evidence for the manufacture of malt and ale at some of the Orcadian neolithic sites, such as Skara Brae and Barnhouse, six thousand years ago. At Skara Brae there were sherds from a large 30 gallon pot found beside the central hearth. Excavated by Vere Gordon Childe in the 1930s, no residue analysis was done on these pot sherds. Its' location would be an ideal spot for a fermenting barley wort. At the site of Barnhouse, another neolithic village, there was a possible malting floor as well as many drains which are essential for a brewer. Analysis of pot sherds using the technique of Gas Chromatography/Mass Spectrometry revealed "unidentified sugars and barley lipids" in the fabric of the pottery. It's a possible indication of sparging. If they were sparging to obtain a wort then they must have been making malt and ale. If you want to read more about neolithic and bronze age evidence, I suggest you have a look here at an article we wrote for Orkneyjar a few years ago. It's about the prehistoric transformation of grain into ale. You'll also find links to my published academic papers and to my thesis. I know of no other archaeologists who are working on the archaeological evidence for the manufacture of barley malt and ale in the neolithic. It seems to be considered a controversial topic by some academics, or so I am told. That's why I was pleased to see my work referred to at this malting seminar. Clearly the professional maltsters, brewers and distillers have no problem with the idea. Eric described how floor malting is labour intensive, requiring skilled and dedicated people. It was the only way of making malt until the mid 19th century. 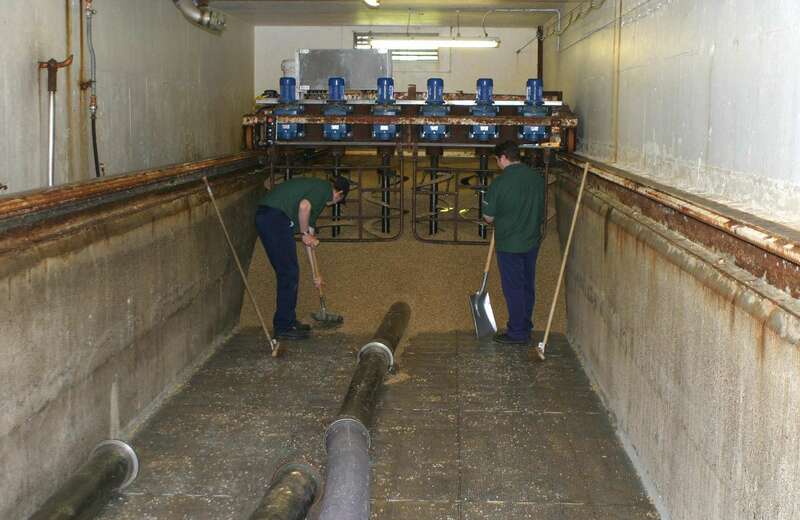 The malt must be turned and raked on the floor, as well as being moved around the maltings from steep tank to germination floor, and from there to the kiln floor. It takes many workers to make the malt. Modern pneumatic maltings changed all of this. The workers who turned the malt cannot have been happy about this. For many, it meant the loss of their job. It was, in so many ways, a revolution in the malting industry, although it took several decades, until the 1960s, before Saladin boxes became commonplace in a maltings. The technology of making malt developed rapidly. By the early 1970s, Saladin drums were being made and used. These are far larger and capable of producing thirty to fifty tonnes of malt at a time, in a continuous batching process. They can be operated all year round, in contrast to a traditional floor maltings that were subject to weather and temperature (see previous post). Much less manpower is needed, there is a lower cost of production. They consistently produce good quality malt in the quantity that is required today in the modern brewing and distilling business. "I climbed the stairs of one of these enormous, modern cylindrical towers to discover vast stainless-steel steeping tanks, malting floors and kilns. Having seen the simple, homely methods of the floor maltings, the scale and functionality came as a shock. Each of the tanks handles more than ten times the amount the entire floor malting facility can process in one go. At the push of a few buttons, the process gets underway – steeping, germination, kilning. Such are the efficiencies that germination is a day shorter here, and kilning only takes two days. The equipment is also much easier to clean, so you can see why new technology has its supporters in the industry. Once malted, the grains are quickly shipped out to breweries or malt merchants. Crisp’s job is done. The brewer will ultimately claim the credit for his wonderful beer, but, as the old saying puts it, you can’t make a silk purse out of a sow’s ear. There’s a lot of skill and care that goes into that drink even before the brewer starts his work. The next time you are entranced by a hoppy aroma as you raise a pint to your lips, stop, wait and think. Look beyond the green, tangy, zesty glory boys that steal the limelight and remember the malt and the maltster, the forgotten heroes of brewing." In his final remarks about malt and malting techniques, Eric Walker reminded us of some of the fundamental principles. Malt is a living thing. If it is not correctly steeped it can either drown or asphyxiate. It needs careful handling. The maltsters who make malt in these large vessels take as much care of it as the traditional floor maltster, there's a whole new set of skills and knowledge involved in the craft of making huge batches of good quality malt. The maltster's rub, whereby the maltster judges when it is ready for kilning, still applies. Ancient skills and knowledge are combined with modern technology. "is a process utilised by the ancients to produce palatable alcoholic beverages: ale and beer." Who were the first maltsters? Archaeological evidence for floor malting. PS In one of my earlier blogs I've asked: where have all the malting floors gone?